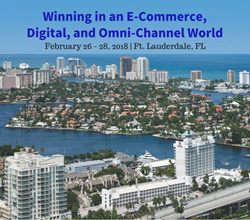 Supply Chain Industry Leaders will gather in Fort Lauderdale, Florida from February 26 – 28 during Connect 2018 to discuss how to win in an e-commerce, digital and omnichannel world and how to strategically leverage the latest technologies and tools available from subject matter experts in and out of their business sector. The event, produced by The Foundation for Strategic Sourcing (F4SS), will welcome presenters from a number of high profile companies at the cutting-edge of supply chain, e-commerce, and technology innovations. “F4SS Connect 2018 is going to address our industry’s greatest challenges and uncertainties as the face of retail is going through a seismic shift and the technology available to consumers, retailers, manufacturers and suppliers is creating the need for faster, cheaper and more transparent solutions. The speakers we’ve assembled will address issues from the e-commerce flywheel, to blockchain technology, to using military optical systems to reduce quality checks, to leveraging data and the IT, to how FDM retailers are shifting the in-store experience to better compete in an omnichannel world, to how business and government together are creating jobs and transforming inner cities driven by e-commerce,” says Steve Weinstein, Global Value Stream Leader at Johnson & Johnson Consumer Companies and Chair of the F4SS Board of Directors. The event in February marks the 11th year that Connect has been held. About F4SS: The Foundation for Strategic Sourcing (F4SS) is a non-profit organization representing the secondary packaging/contract manufacturing industry with a membership of nearly 60 Consumer Packaged Goods marketers and suppliers, which translates into approximately 1,110,000 employees and over $522,866,100 in annual sales. F4SS was formed on five simple, yet powerful, core values that it strives to offer every member: Trust. Collaboration. Inclusion. Continuous Improvement. Openness.